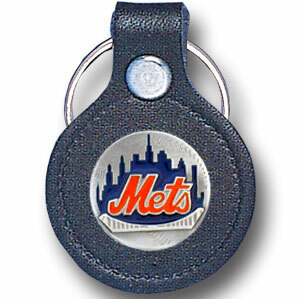 This genuine leather keychain contains a pewter medallion featuring a licensed New York Mets MLB emblem. The medallion is made from 100% lead free pewter, and enameled in team colors. You're going to love this one! Overall length of this sturdy keychain is 3 inches, and the leather pad is 1 1/2" in diameter. The leather fob is riveted to the key ring for added durability.